Do you remember Amitabh Bachchan and Rekha’s romantic medley – Dekha Ek khwaab… amidst blushing tulip fields? 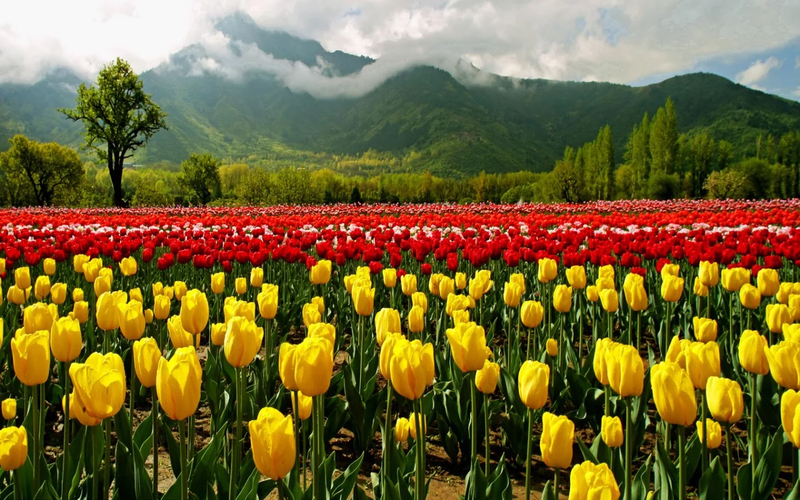 This lyrical romance just not portrayed Kashmir as director’s muse, but also reflected the eternal beauty of Asia’s largest Tulip Garden, Siraj Bagh. Come spring, as the first rays of the April sun stretch out over the Zabarwan Range, the first blooms burst through the soil and unfurl into a carpet of blossoms. Siraj Bagh, popularly known as the Indira Gandhi Memorial Tulip Garden in Srinagar is the largest tulip garden in Asia and unfolds this greatest spectacle. 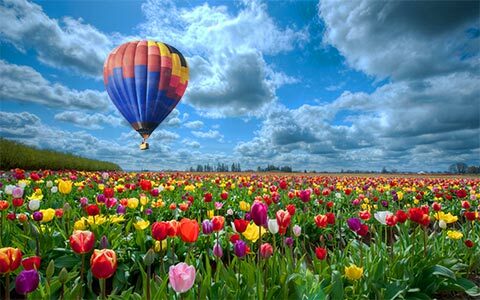 It’s then, that the Tulip Garden offers a grand show of more than 20 lakh tulips of 46 varieties. You can just see those dainty flowers in contrasting colours, spread across a vast green landscape overlooking the pristine Dal Lake. The garden opens its gates on the 29th March. The dates of the actual festival vary depending on the estimated time of blooming, which usually falls between 5th and 10th April and lasts for a little under three weeks. Lose yourself in the flowerbeds that have lit up generations of Hindi film backgrounds. Neat rows of yellows, reds and pinks stretch out as far as the eye can see. Want to visit Kashmir? Book a comfortable RailYatri outstation cab service and head to this mesmerising destination, right away! 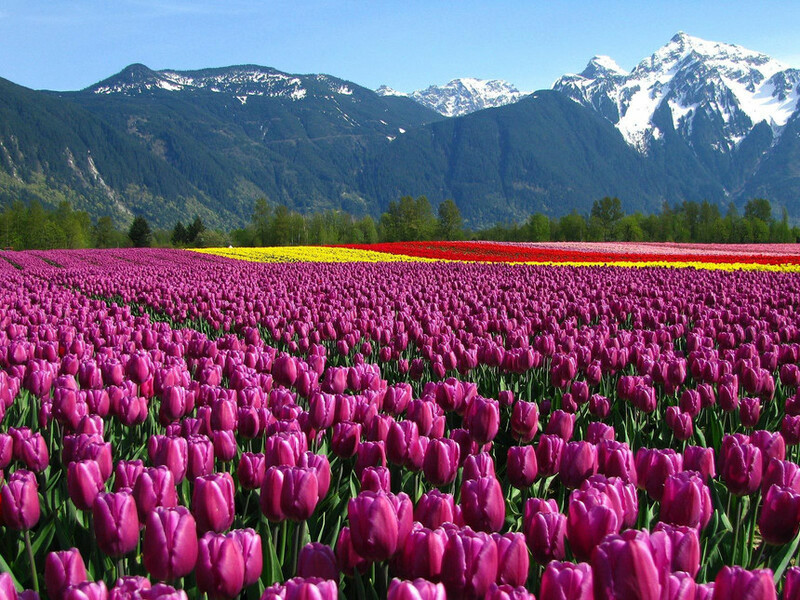 Since all these efforts are made to promote Kashmir’s tourism, visitors will not only get an eye full of nature but also get to acquaint themselves with Kashmiri folk dance and music as well as local handicrafts, both of which are a part of the Tulip Festival. It is also a great place to get a mouthful of Kashmiri delicacies. Pick up some elegantly embroidered jackets and delicately painted lac boxes to take home, or deck yourself out in full Kashmiri kit for photobombing. Note: Want to visit Kashmir? Download RailYatri app and book exclusive Kashmir package with RailYatri. Experience a mesmerising stay at God’s heaven, literally! Pari Mahal–The most amazing Chashm-E-Shahi Garden, this historic monument was a Buddhist Monastery once upon a time. 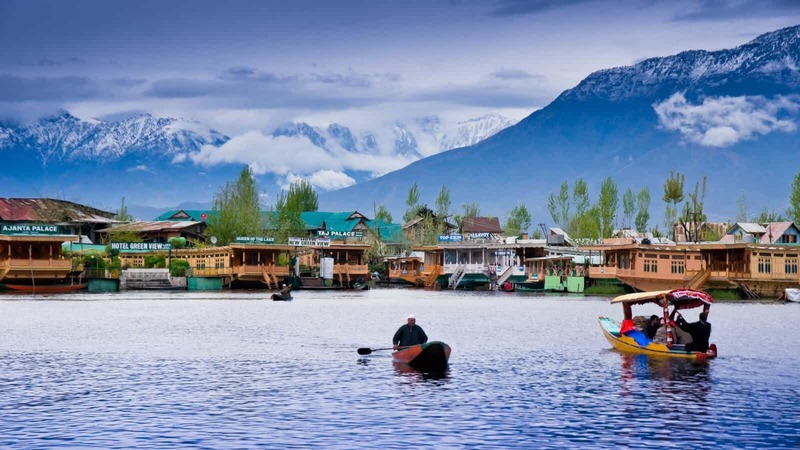 Dal Lake– Dal Lake is considered as a paradise on the Earth. One must try a Shikara Ride here. Shankaracharya’s Temple– Soaking in the beauty of snowy Pir Panjal Range, this old- aged temple is situated at a height of 1100 ft.
Shalimar Bagh– This is that another embellished garden that the Mughal emperor Jahangir built, which is a great example of Mughal craftsmanship. 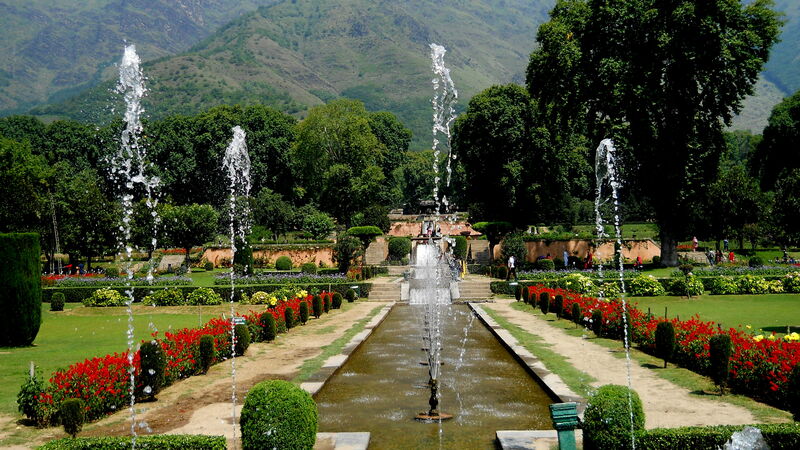 Nishat Garden– This can be spotted within 3.2 km away from the Tulip Garden, Nishat Bagh is also the home to huge avenues of rare flowers, fountains and chinar trees. Local Market– The visit to the local market is to buy different specialities one gets in Srinagar like Kashmiri Shawls, mats, wooden clothes, rugs, dry fruits and leather products etc. Hazratbal Shrine – This is the sacred shrine for Muslims and is a fine example of antiquity and architecture. The shrine is dedicated to the inheritor, Prophet Muhammad. 1# Every year, these tulip bulbs are imported from Holland, planted here in Siraj Bagh, thus throwing the most beautiful Tulip Festival. It showcases the culture and beauty of the place. 2# An entry into this garden offers a wide window to the paradise. The eye gets riveted to the numerous parallel running rows of more than a million, a variety of multi-coloured tulips. 3# Tulip garden has been created by carving out seven terraces on a gentle sloping ground; a move in any direction leaves us spellbound by the multi-tier flowers. How to get there: The Indira Gandhi Memorial Tulip Garden is located, in Srinagar, right between the Mughul gardens and Nishat Bagh. It is a very popular location and is easily accessible by road. Get intrigued and experience this riot of reds, yellows, pinks, whites and the most spectacular of blues and purples. 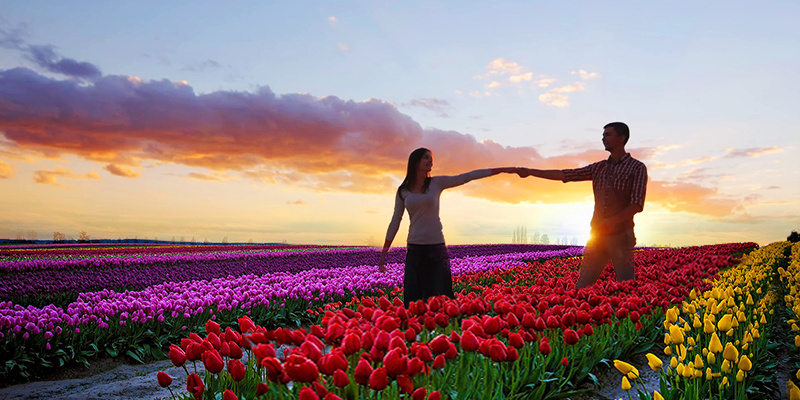 Take long romantic walks among the flowers and capture forever memories in your cameras and hearts. Next article6 Best last-minute Weekend Trips, for the lazy planners ! Gardens provide a space for people to interact with each other and meet the new person every day.